New bandwidth-intensive data and multimedia applications, along with faster, higher capacity LAN equipment will continue to demand more from cabling systems. Now complete end-to-end fibre optic solutions for today's requirements and tomorrow’s demands are available from many manufacturers. These systems offer the industry’s most comprehensive horizontal and backbone fibre cabling solutions available today. High performance cabling systems, utilising laser-optimized fibre for superior transmission performance for applications like 1G and 10G Ethernet are becoming more common. These are ideal for companies that do not yet require a 10 gigabit system, but still need a high-performance system that can support gigabit Ethernet applications. At Airpath we have some of the best fibre installation engineers in the industry – trained to install, spice, terminate and test all forms of fibre utilising the latest state-of-the-art Fusion Splicing technology. These range from single & multi mode (OM1, OM2, OM3) to blown fibre installations. DISTANCE: Signals can be transmitted further without needing to be "refreshed" or strengthened. 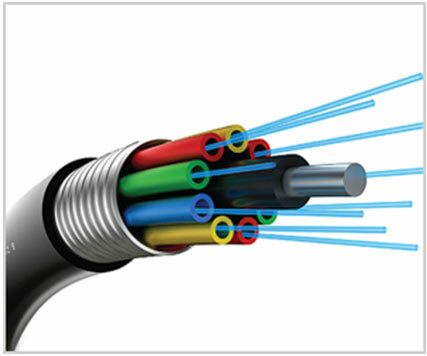 MAINTENANCE: Fibre optic cables costs much less to maintain. In recent years it has become apparent that fibre-optics are steadily replacing copper wire as an appropriate means of communication signal transmission. They span the long distances between local phone systems as well as providing the backbone for many network systems. Other system users include cable television services, university campuses, office buildings, industrial plants, and electric utility companies.